Valentine's Day is just around the corner and I'm sure lovers in love are planning something extra special for this year's heart day. Tapella and Gaudi Restaurant nestled at the cosmopolitan Serendra and Greenbelt 5, will make that day perfect place to enjoy a romantic evening. Share a cocktail in front of the bar area or enjoy an amazing prefix dinner whatever you desire, Valentine is definitely worth to celebrate. Nothing could be more perfect than celebrating a delightful and sumptuous dinner with a sparkling Cava amidst a posh and chic ambiance. 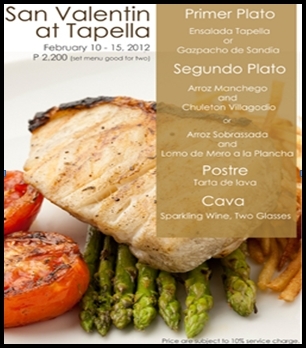 February 10 to 15, take pleasure in a 3 course meal good for a pair or more. Highlighting the Gaudi’s best seller Chuleton Villagodio, a certified Angus Beef grilled Villagodio style and Arroz Manchego, paella bursting with manchego cheese, chicken, asparagus and shrimp paella. Lomo de Mero a la Plancha, or grilled sea bass with asparagus paired with Arroz Sobresada, a chorizo enriched paella. Of course, to start the meal is through a fresh salad or soup definitely worth a try and Gorge with Ensalada de Tapella, tossed greens drizzed with house dressing or Gazpacho de Sandia, cold tomato and watermelon soup with fresh cheese and mint. For the finale, be sure to leave some space for Tarta de Lava, oozing with rich chocolate this cake is another Gaudi’s certified dessert contender. How's that for celebration of Valentine's Day? I bet you were all excited at Tapella and Gaudi at Greenbelt 5 and Serendra which are also surrounded by high end shops, top Business Offices and theatres, making it the best choice to ensure an ideal Valentine celebration. For more information or reservations, call 7572710 and 7572711.